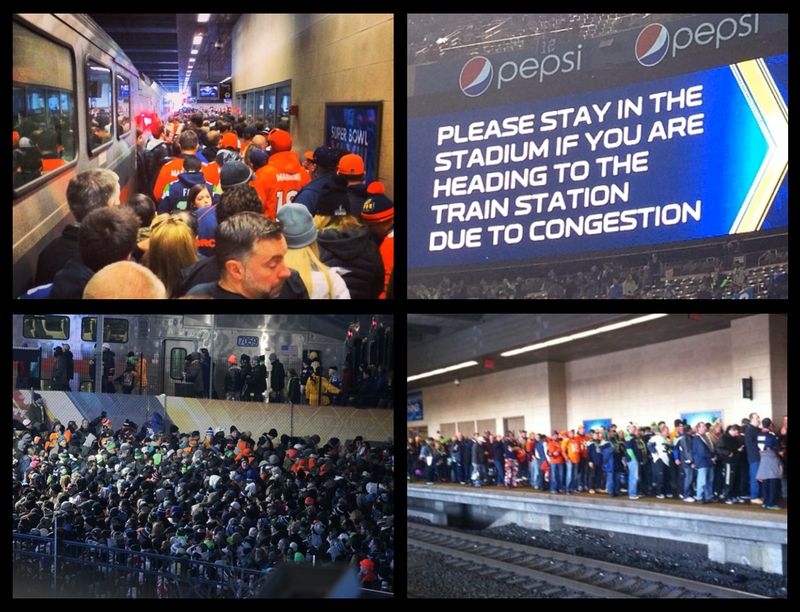 In the weeks leading up to Super Bowl XLVIII, NJ Transit officials reassured the public that they were ready for the surge of fans taking the train to MetLife Stadium. Prior to the game, NJ Transit sold 7,000 advance rail tickets for an estimated ridership of around 10,000 to 12,000 people. However, as the last train left MetLife Stadium at 12:45 AM on Monday, the final ridership numbers ended up being far greater than anyone (publicly) anticipated: 29,000 people took the train to the game and 33,000 people took the train home. It would end up taking well over three hours to usher all of these 33,000 riders to Secaucus Junction, where they could connect to trains going to either New York City or other New Jersey destinations. Along the way, overcrowding and under-preparedness caused a painfully uncomfortable experience for all. Riders waiting for trains at MetLife Stadium endured 20-degree temperatures for hours after the game. Passengers transferring at Secaucus Junction braved the “sauna”-like heat of thousands of frustrated fans packed into tight, unmoving corridors before security checkpoints, which even resulted in several incidents requiring medical attention. Many threw out words like “disaster” and “nightmare” to describe the first “mass transit” Super Bowl. But the failure of NJ Transit to adequately deal with the departure of football fans from an event that had been years in the making reflects a broader problem with the planning of our transportation infrastructure projects. 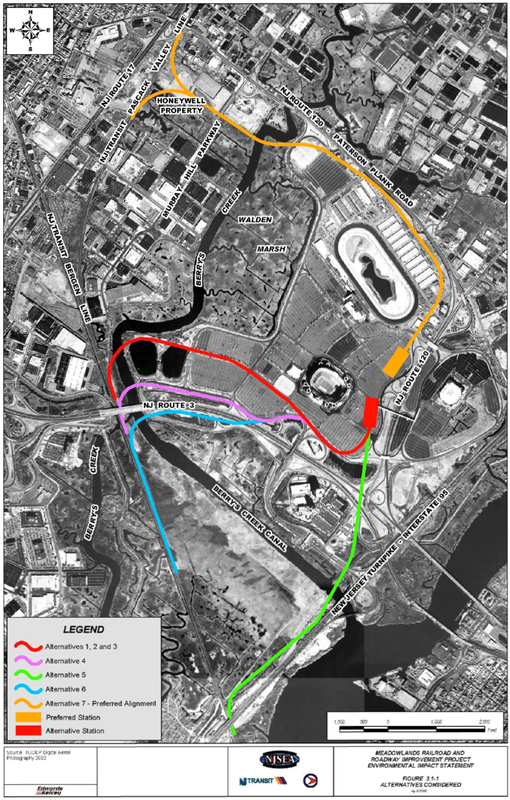 When the New Jersey Sports & Exposition Authority (NJSEA) was planning the construction of the new Meadowlands train station in 2005, it prepared a final environmental impact study, which looked at the effects of the new station on everything from decreased vegetation for local wildlife to the potential disturbance of archeological resources. Originally, the new station was estimated to serve approximately 9,600 riders on game days. 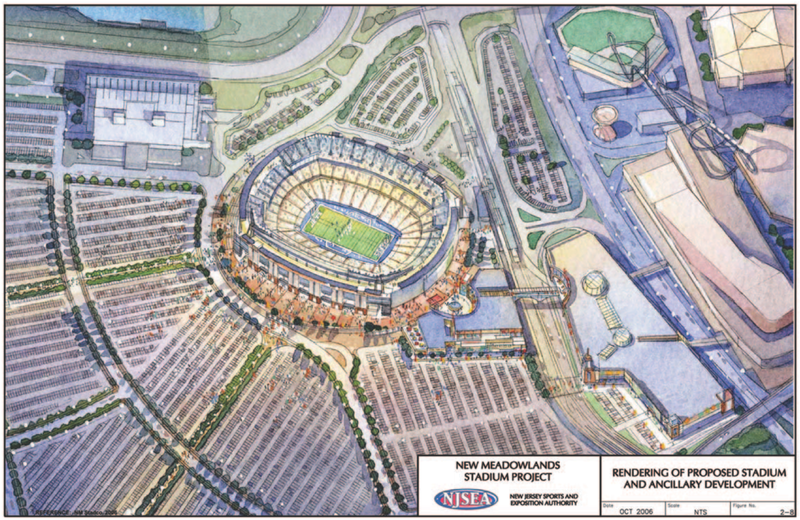 For the purposes of planning (and meeting certain standards for emergency situations), NJSEA assumed a “peak-hour pedestrian demand of 12,000 riders.” Under those presumed conditions, the study was approved and construction of the new Meadowlands train station commenced in 2008. For better or worse, NJSEA’s expectations would be quickly exceeded. During the station’s first weeks of operation in 2009, only 7,000 football fans took trains to the stadium on game days. However, on the night of the first concert since the rail link opened, over 20,000 U2 fans took the train to the new Meadowlands station. This, understandably, clogged the overcapacity station and relegated fans into cramped lines, “pressed together like cattle,” as they waited for hours just to board a train, let alone arrive at their final destination. Today, overcrowding remains a problem for the station and a deterrent to those deciding whether to take a train to MetLife Stadium. Nevertheless, an average of 15,500 riders take the train to a regular season football game. And while getting to MetLife Stadium is a relatively orderly process with posted train times and manageable crowding, after the game ends, the “organized” chaos begins. To start, thousands of departing fans are directed into a single entryway on the south end of the train platforms. In order to facilitate an equal distribution of passengers to the cars, train doors are left closed until the entire platform is saturated with riders. Even when a train is ready to depart, however, there are numerous points in which delays threaten the trip back to New York Penn Station. First, trains must rejoin the Pascack Valley Line from the Meadowlands rail spur. Second, thousands of riders simultaneously pile out at Secuacus Junction. The transfer to New York-bound trains is usually slow, although steady. But the unknown departure times of trains leaving from Secaucus to New York Penn Station can cause additional delays. Finally, the arrival of MetLife Stadium crowds into New York is met with the usual crowding seen during rush hours in the overburdened Penn Station. For all the consideration that went into the planning of the Meadowlands train station, little was done to ensure the reliable and efficient incorporation of that station into the broader transit system. Some have blamed the delays and long-waits on the necessary security check points. It is true that the Super Bowl was without any (major) incidents, and credit must be awarded to all of the government agencies that kept attendees safe. But shouldn’t the impact of security have been taken into account when the Meadowlands train station was being planned? 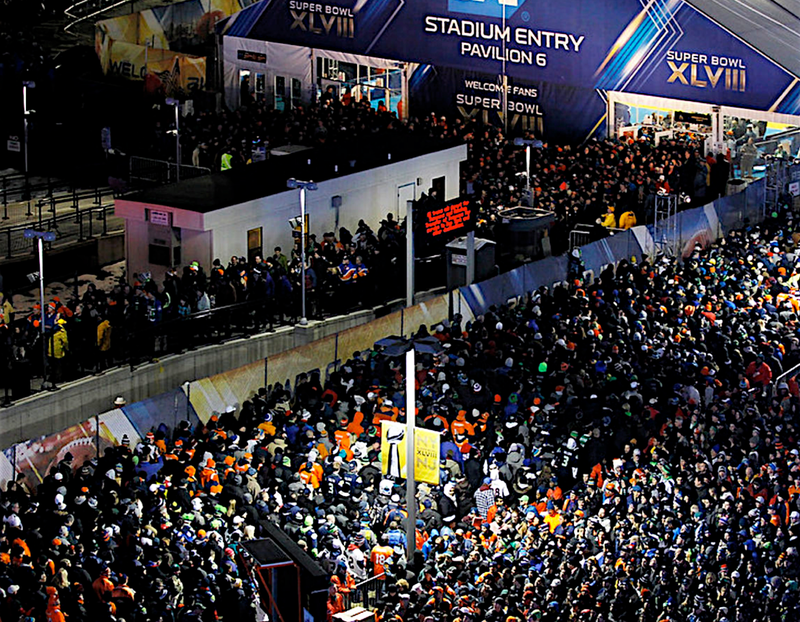 After all, security checkpoints are routine during football games, whether at the Super Bowl or a pre-season Jets game. Others say that moving large crowds of people is always going to take time no matter what you do. But should it really take three hours for fans to leave an event that was being planned for the better part of the last decade? Perhaps the most significant failure in the planning of the Meadowlands rail link is the lack of a one-seat ride between New York City and the Meadowlands. The Secaucus Junction transfer between Hoboken-bound trains and New York-bound trains results in travel delays not only from the actual unboarding and reboarding of thousands of passengers at once, but because of delays in the timing of two previously unscheduled trains within a non-terminus station. While Secaucus Junction today has two unused tracks that allow New York-bound trains to idle, in the future, these tracks will be a part of regular service, which will likely cause additional delays. The chosen alignment for the Meadowlands rail line also creates an unusual single-station terminus in an otherwise comprehensive rail network. Alternative alignments, which would have allowed the Meadowlands rail spur to connect to a future West Shore Rail Line were studied by NJ Transit, but were ultimately shelved for various environmental reasons. Again, NJ Transit failed to see the forest through the trees, or in this case, the meadowlands. At the heart of the problems that occurred at the Super Bowl was NJ Transit’s fundamental misunderstanding of the overwhelming desire of the public to utilize mass transportation where it is offered. In the most mass transit friendly city in the nation, it should not have been a surprise that over 30,000 football fans (as opposed to 12,000) actually preferred to take the train to the Super Bowl. And despite NJ Transit’s unintentional efforts at dissuading would-be riders from using public transportation, the use of rail in New Jersey continues to rise at a tremendous pace. The construction of new transit elements provides great opportunities to close service gaps and increase overall efficiency for a public ridership that has increasingly depended on mass transit to get from point A to B. In the future, NJ Transit must look beyond the short-term, limited scope of its planning and instead focus on how the realistic use of its infrastructure will function within the larger interstate transit network.